Services: 10.30a.m followed by tea/coffee in the hall. Holy Communion normally 1st Sunday of each month. Sunday Seekers for children aged 3-11 during Sunday Worship. 6.00 p.m. Evening Fellowship. A small meeting led by the members. 09.30am Quiet Time – Thirty minutes of prayer and reflection to start the day. 2.00-3.00p.m. Bible Study. Exploration and learning with a small enthusiastic group. 2.15p.m. Fellowship – A friendly & light-hearted meeting for all with interesting speakers & varied activities. 10-11.30a.m. Coffee Mornings 1st (Traidcraft), 2nd & 5th (Coffee’n’Chat), 4th (Good News Library). (3rd of each month) Soup & Sweet Lunch – followed by a short service (optional). 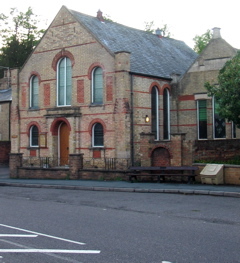 This Church is in the St. Neots and Huntingdon Circuit. The Circuit also has its own website here. A list of all the churches in The St. Neots and Huntingdon Circuit can be found lower down this page.